have hiked the Appalachian Trail in each of the 14 states it passes through. And I expect to expand my collection of stories from the Trail. Talking to people on the A.T. surely is one of the most gratifying and delightful elements of my new position with the Appalachian Trail Conservancy (ATC). At Cat Rocks in New York’s Harlem Valley, on a lovely spring morning, I met a father and son who were so inspired by the beauty of the Trail, they wanted to know how to join a work crew. In Pennsylvania, atop a ridge, I met two veterans who were hiking the Trail as a respite between the memories of battle and their future ahead. And, yes, I could go on. In six months, I’ve traveled to 12 of the A.T.’s 14 states, some more than once. (Massachusetts and Tennessee here I come.) My opportunities to get on the A.T. have been associated with meetings with partners, clubs, allies, and friends of the ATC. Each of those opportunities to put boots on the ground has been the impetus and the inspiration for making certain the A.T. is managed responsibly now for the long-term future. Just as every section of the A.T. is unique, the ATC’s forward-looking efforts to preserve and protect the entire Trail corridor are rooted in respect for each state and each community. Hundreds of communities benefit from proximity to the A.T. Forty-seven towns and cities have now identified themselves as an official A.T. Community. 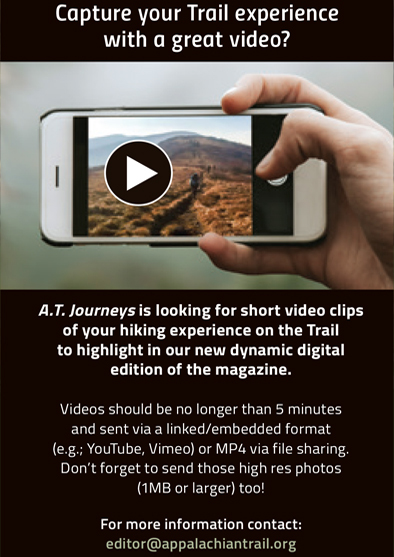 And just like the personal stories of the hikers I meet, the identity of each A.T. Community is unique, compelling, and memorable. The way the ATC works with designated communities along the Trail purposefully avoids cookie-cutter tactics. We’re committed to helping communities promote their distinctive qualities — as we work to make certain the entire Trail is unified in inviting visitors from all over the world. In this issue, we feature the remarkable photographs of Jacob Bryant, who grew up in the unusual landscape near the Delaware Water Gap, a landscape initially formed 500 million years ago and then carved by a river. Jacob’s dazzling photographs tie into the inspired vision of community leaders who live and thrive in the area. We also highlight the borough of Delaware Water Gap, a historic quaint town in northeastern Pennsylvania, located within a stone’s throw of Delaware Water Gap National Recreation Area. The small town — an A.T. Community for the past four years — offers multiple recreation options, including exceptional access to 28 miles of the A.T. The ATC, in close collaboration with town leaders, has recently ramped up efforts to examine how we assist in showcasing this community’s attributes while developing an overall brand for communities along the Trail. In the Borough, it is our pleasure to work with people like Susan Cooper, owner of the charming Village Farmer and Bakery, and her son and daughter-in law, Chuck and Rachele, who own Edge of the Woods Outfitters. Business owners like Susan, Chuck, and Rachele form the backbone of the A.T. Community program. What they provide is hospitality, commitment to the long-term future of the Trail, and their personal stories. Because personal connections are what the A.T. is all about. In “Trail Stories,” check out the inspirational story of Anna Huthmaker — who describes her size and shape as “not your traditional thru-hiker.” Anna turned her initial hiking dream into a national movement that now has women of all shapes, sizes, and ages celebrating the outdoors and themselves. In “As I See It,” you won’t want to miss the compelling commentary of Anne Schubert, who is setting out this summer to turn a decade-long lingering idea into a solid plan of hiking 50 miles of the Trail for her 50th birthday. In these stories and others, there is a common thread about latching onto a goal and getting out there and doing it. These stories and my meetings with hikers along the Trail inspire me in my personal 14-state A.T. challenge. 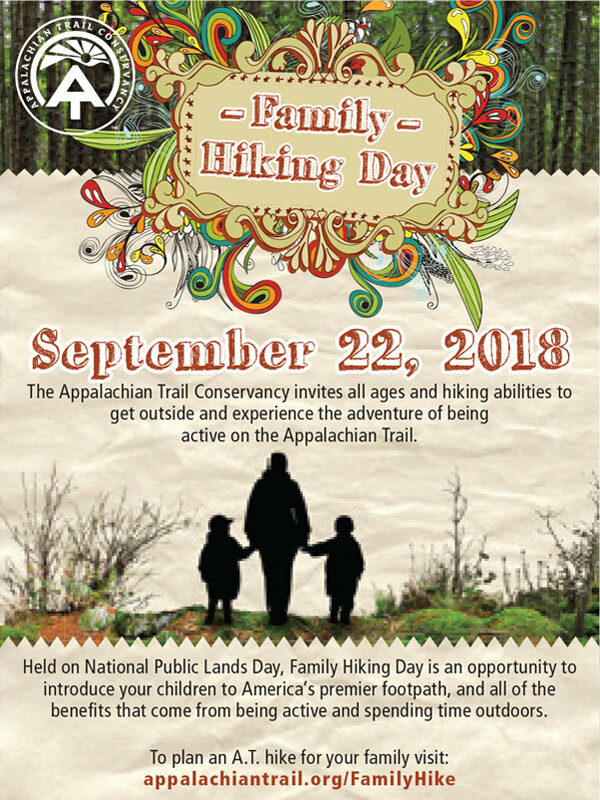 I encourage you to find your own part of the Trail, to stretch your legs and lungs, and to make certain you stop to enjoy the spectacular world-renowned Appalachian National Scenic Trail. Located in a valley below the ridges of the Appalachians, Delaware Water Gap is surrounded by spectacular views of steep mountainsides and is easily accessed from several major cities. Women of different ages, backgrounds, and hiking experience take to the Trail and find strength, solace, and harmony with their femininity in each hike. The Appalachian Trail and its surrounding landscape is a treasure trove of biological diversity that extends along the entire eastern United States — and requires a collaborative effort to protect it. The concept of “forest bathing” is simple: step into the woods and take time to bask in the benefits of your natural surroundings. Since the start of her 30-year career with the ATC, Karen Lutz has taken on highly unusual challenges and embraced complex responsibilities with gusto. Photographer Jacob Bryant “chases the light” to share what is exceptional about the scenery just a short way from home. Grant Davies and Stephanie Martz bring energy, enthusiasm, and professional experience to their new roles with the ATC. Trail Dames: Anna Huthmaker went from her dream of a thru-hike to leading a path for women of all shape and sizes to fall in love with the Trail. On the brink of her 50th birthday, a day hiking enthusiast sets her sights on an ambitious 50-mile solo backpacking trip to celebrate. thrilled! [My husband and I] thru-hiked in 2016. Here is a short summary of our hike: Fourteen bears, charged by a moose, 90 mph winds on Mount Washington, lightning on Mount Moosilauke, and frozen hands on Roan Mountain. Best time of our lives. Thank you to all the volunteers and the ATC who work to keep the Trail what it is. article in the Winter 2018 issue and cheered. This is my journey. I have hiked in seven states: New Jersey and all states north. My requirement is a three-day-trip, minimum, with two nights on the Trail in each state. This year, I will be hiking from Snicker’s Gap into Harpers Ferry to cross off West Virginia as my eighth state. I fly from Alaska almost every year to hike in another state on the A.T. I am glad to see that my way of hiking the Trail is recognized. then friend — gave me a signed copy of Cindy Ross’s book, A Women’s Journey. I had found myself involved with the Potomac Appalachian Trail Club (PATC), somehow making my way onto council as the general secretary — with little knowledge and even less experience. But the Appalachian Trail, as I’ve shared before, had caught both my attention and my imagination. And I wanted to not just volunteer and manage the Trail — I wanted to learn to hike it. Growing up in urban New Jersey, my family did not spend a lot of time out in the woods. Vacations were trips “back home” to Pennsylvania or “down the shore.” My first experiences with hiking were the day hikes in and out of work sites (the first project I worked on was the construction of Rod Hollow Shelter). But I wanted to know what it was like backpacking. As you can imagine, there was no shortage of gear advice as well as thoughts on where and when I should have my first experiences. My first backpack was an external frame (red!) backpack. When you added in sleeping bag and Thermarest, packable pillow, food, stove, water bottles, too many changes of clothes, and heavy camp shoes, it was probably hovering around 45-plus pounds. But I was also in my mid-twenties, so what I lacked in sense I made up for in youth and energy. And I found I really loved the experience. I loved that everything I needed to take care of myself I could pack in this bag on my back. I loved that I could see things and go places that could only be accessed by helicopter or my own two feet. And I loved the community I found on not just the A.T., but all the trails I hiked. In the 1980s, there were not a lot of women in that community. I had a group from PATC that hiked together. Trail Clubs have a long and rich history of women members working side-by-side the men making equal contributions. But in general, we girls were in the minority. That’s why, A Women’s Journey made such an impact on me. Here was a contemporary woman talking about not just hiking, but hiking the entire Appalachian Trail as a woman. Ross mentions the number one question asked of her is, “Aren’t you afraid?” How many times has a male hiker been asked that question? She explores loneliness and solitude. And she even talks honestly about how to manage menstruation and other “women hygiene” issues. It was revolutionary in so many ways. As you read through this issue of A.T. Journeys, you’ll see that much has changed for women in the outdoors. We are there in greater numbers than ever across all wilderness recreation activities. We come in all shapes, sizes, ages, and colors; we come together with male and female partners or we tackle the experiences on our own. But, while much has changed, there is still a long way to go. Women and people of color are still in the minority on our trails. Staffs of conservation nonprofits (the Appalachian Trail Conservancy included) continue to be predominantly white and often predominately male. Board’s fare even worse, where older, white men still represent the majority of nonprofit leadership. In so many ways, this is still a journey for all of us. Ensuring inclusivity is not a passive endeavor. We need to invite, encourage, and mentor everyone with the interest and desire to experience the outdoors as a whole and most especially our very special Trail. Without even knowing it at the time, Cindy did just that for me (as did my dear husband in sharing her book with me — you can see why I married him). We all will have opportunities to do the same. And the Trail itself will be richer for it. Conservation biologist Pete McKinley of the Wilderness Society believes the best hope for maintaining the biological diversity of the eastern United States requires enhanced protection of the Appalachian Trail and its greater landscape. Pete maintains the A.T. landscape is playing — and will increasingly play — a prominent role in the protection and adaptation of the eastern forest and its plants, animals, waters, and soils in the face of habitat loss, fragmentation and, now, a rapidly changing climate. “The Appalachian Trail landscape is a treasure trove of biological diversity,” he says. “The landscape will thrive and flourish best through conservation that maintains and enhances large-scale ecological connectivity among large contiguous forest blocks.” The ingredients for an un-fragmented forest network that is resilient to climate change are in place along the Trail landscape, but much work remains. Large, biologically diverse and contiguous forest blocks exist along the extent of the entire A.T. — sometimes connected by protected landscapes in meaningful units, sometimes protected merely as a thread and sometimes not protected at all. Congratulations to our winners in the myATstory Photo Contest, who featured jaw-dropping photos from the Appalachian Trail. Chosen by thousands of voters, Shawn Osgood’s “Step into the Unknown” took first place, showcasing the beauty of cloud-soaked Tuckerman Ravine in the White Mountains. Chelsea Fisher and Kirsten Fraude took second and third place respectively with photos featuring the simultaneous grandeur and intimacy of hiking on the A.T. Volunteers cleared portions of the A.T. in late May and early June during a historic clean-up effort. Severe storms and prolonged rains caused flooding and downed trees from northern Virginia to New York in mid-May. Sections of the A.T. in New York east of the Hudson River had intense damage with reports of microbursts and tornadoes; a couple areas for several miles were almost impassible. Heavy rains also caused road damage and mudslides on the Maryland side of the Potomac River, which necessitated closure of the Goodloe Byron Memorial Footbridge that connects Harpers Ferry and the C&O Towpath – temporarily closing four miles of the A.T. from Harpers Ferry north into Maryland, with no safe alternative other than to hire a shuttle during the peak of hiking season. The same storm system created dangerously high rivers in the southern region of the Trail. SIGN UP AT: appalachiantrail.org/NTSA50 to pledge to hike 50 miles or volunteer 50 hours in celebration of the Appalachian Trail’s anniversary as one of the nation’s first National Scenic Trails. Help us celebrate the 50th anniversary of the National Trails System Act and earn a commemorative certificate of your accomplishment. The “How to Hike the A.T.” backpacking courses will help new hikers feel prepared to successfully hike the A.T., while gaining an appreciation for the outdoors, knowledge of the Trail, and long-distance hiking culture. Course graduates should leave as competent, responsible hikers prepared to accomplish their version of a successful long-distance hike. Note that participants will be spending the two nights/three-days backpacking, rain or shine. Courses are limited to six participants, and spots will be tentatively reserved on a first come, first serve basis. Pending review, applicants will be chosen by ATC staff. Cost of courses are $375 per person, which includes food. Ticks, which carry Lyme disease and other serious illnesses, are a risk on any hike. Taking the right precautions can decrease your chances of being bitten by a tick and awareness of symptoms can help to treat illnesses early. In its fourth year, the Flip Flop Festival kicked off the outdoor recreation season in Harpers Ferry and Bolivar, West Virginia. Event highlights included a festival quest, local vendors, live music, a craft beer tasting, a farmer’s market, a climbing wall, and a first-ever flip flopper reunion. Workshops and activities helped introduce festival-goers to the wide variety of outdoor pursuits available in Harpers Ferry, as well as prepare current and future flip floppers for sustainable thru-hikes beginning mid-Trail. These innovative thru-hikes not only offer benefits to hikers but help conserve the Trail by dispersing use and helping sustain local Trail-friendly businesses in their shoulder seasons. Two returning directors and three newcomers have been nominated for open positions on the Appalachian Trail Conservancy (ATC) Board of Directors for 2018 to 2021, with elections scheduled prior to the organization’s annual meeting in Shepherdstown, West Virginia, on August 12. Edward Guyot, a principal in a Keene, New Hampshire, accounting firm and a director since 2013, was nominated to serve as secretary, and Shalin Desai of Hudson, Massachusetts, a director since 2017, was nominated to a new three-year term. Also nominated by a committee chaired by outgoing secretary Elizabeth P. Thompson to serve three-year terms were: Grant Davies of Chevy Chase, Maryland, and Charles Town, West Virginia; Thomas L. Gregg of the Washington, D.C., area; and James LaTorre of Potomac, Maryland. Further information on the meeting, the new elections process, and the nominees can be found on page 37 or at: appalachiantrail.org. Additional nominations may be made by petitions signed by at least 100 members of the ATC in good standing and sent prior to July 23, 2018, to Suzanne Dixon, president and CEO, at ATC headquarters in Harpers Ferry, West Virginia. Fifteen striking photographs representing the Appalachian Trail will be displayed in the U.S. Senate Russell Rotunda the week of September 17-21, 2018. The exhibit will be open to the public. The exhibit — titled “United by the Appalachian Trail” — coincides with National Public Lands Day on Saturday, September 22, and the 50th anniversary of the National Trails System Act on Tuesday, October 2, 2018. The exhibit has been organized by the Appalachian Trail Conservancy. Senator Richard Burr (R-NC) sponsored the exhibit and oversaw its approval for this rare opportunity on Capitol Hill. W hen I reflect on my experience as a thru-hiker, record setter, and as a mother day hiking with her children, I can recall instances when I felt fully aware of my femininity and deeply connected to my sexual identity and, yet, at other times gender differences seemed nonexistent on the Appalachian Trail. Rustling leaves. Creaking trunks. The green smell of the earth after a light rain. Sunlight falling through the lacework of leaves. Just reading a description of being in the forest might make you pause, take a deep breath, and feel the soft edge of peace that comes from spending time outdoors. You remember that feeling. Perhaps it’s been a while; or perhaps just yesterday you gave yourself a few minutes on a mossy rock. Either way, it tugs at you, asks you to return. Being in the woods doesn’t just feel good, but is, in fact, good for you. If you’ve ever spent time in the forest yourself, you probably don’t need a scientist to tell you that. I grew up exploring the woods and climbing the trees of New Hampshire, and the idea seems, well, natural to me. My first climbing trees, the crabapple in our front yard and the red maple in our backyard, were like old friends. Depending on my mood, they offered comfort, exhilaration, or peace. I spent a good piece of every summer in the White Mountains hiking the trails, camping, and feeling utterly at home. representative” 30 years ago probably was a bit incomplete, if not deceptive, as perhaps most such documents are. It would have focused on “serving as liaison” between the Appalachian Trail Conservancy (ATC) and agencies at the federal level – and in the region’s six states and between the ATC and the region’s 12 Trail-maintaining organizations, bookended by the relatively large New York-New Jersey Trail conference and the Potomac Appalachian Trail Club. Helping presidents, testifying against murderers, rebuilding the first A.T. section, developing a mutually beneficial agricultural program near where huge warehouses were overtaking other fertile land, serving as local liaison for four ATC biennial conferences, dealing with the Trail’s two Superfund sites — none of that would be mentioned. It then would have pointed to planning for Trail-corridor design, acquisitions of land for the permanent route, and the subsequent footpath relocations — in this case in particular, the 15-mile relocation across Pennsylvania’s Cumberland Valley, site of the most contentious valley relocation in Appalachian Trail history — its route finally selected by the National Park Service (NPS) in December 1985. Some legal battles were at hand, too. But, when Karen Lutz came to the job in July 1988, that particular relocation was in her blood, after more than a decade as an activist with the local PRO-TRAIL Coalition. The coalition was working to replace a roadwalk, where residential and commercial development was blossoming, with a scenic trail route through farmland and woodlands. 1:30 p.m. – 3 :30 p.m. THERE IS NO COST TO ATTEND – AND IT’S OPEN TO THE PUBLIC. However, you must register in advance to enter the secure government facility and attend the meeting in-person. A photo ID will be required to enter the grounds. We’ll be adding more information including the agenda, bios of our board candidates, and other updates — so check back frequently as we get closer to the meeting. Jacob’s photography business is actually a side pursuit as he serves active duty as a 2nd Lieutenant in the Air Force. One day, he plans on taking his camera up and down various parts of the Appalachians, across the country, and around the world, capturing images full time. But, while travelling is no doubt exciting, there will always be something special about those hikes just a short way from home. Gap might be called a triple threat for its recreational appeal, its natural and cultural attributes, and the fact it is easily accessed from several major cities. Within a couple hours’ drive, millions of residents in the New York-Philadelphia area can find themselves in one of the most picturesque locations in the eastern United States, surrounded by a multitude of leisure options. Residents of the borough, the 800 people who live here, know they have a good thing going. Located on the Pennsylvania side of Delaware Water Gap National Recreation Area, the small historic town benefits from recreation seekers and those who travel along the Lackawanna Corridor and Interstate 80. Last year, nearly 3.5 million people visited the national recreation area — thousands of whom hike the area’s 28-mile stretch of Appalachian Trail. Recognizing the A.T.’s importance and the need to build stewardship along the Trail, the hikerfriendly borough of Delaware Water Gap was designated as an official A.T. Community four years ago. Located in a valley below the ridges of the Appalachians, the town is surrounded by spectacular views of steep mountainsides covered with oaks, maples, hickories, and a variety of pines. A distinctive notch — known as “the Gap” — carves deep into the nearby Kittatinny Ridge as Mount Tammany and Mount Minsi, both named after Native American chiefs, rise stately above the river valley. and trail seekers,” says Stephanie Martz, the new co-chair of the Appalachian Trail Conservancy’s (ATC) President’s Advisory Circle. Stephanie and her father-in-law Grant Davies, who is anticipated to join the conservancy’s board in August, have stepped into two important roles with the ATC, adding high energy, enthusiasm, and their professional experience. Grant and his wife Carole-Ann have generously funded the ATC’s opportunity to host a special photo-art exhibit in the U.S. Senate Rotunda in September and the corresponding expenses for a congressional reception and a commemorative booklet. Creating a path for all women to fall in love with the A.T.
try to do this?” I held up a battered and worn copy of Jean Deeds, There Are Mountains to Climb, one of a dozen A.T. books that I owned. It was the year 2000 and that one small question was like the proverbial butterfly who flutters her wings one extra time, creating tsunamis around the world. In my case, that initial question came out of a secret, scary dream that I had — one that became a thru-hike attempt which, in turn, became a national movement. Planning to hike the Pacific Crest Trail in 2019 and am interested in meeting fellow hikers considering the same. I hiked the A.T. in 2016 and have considerable experience in high altitude mountaineering. Please contact me at: [email protected] or 419-989-0126. Front Royal Area Hostel for sale. Located in Chester Gap, Virginia, immediately adjacent to Shenandoah National Park, one-half mile from A.T. (mile 961.4). Established in 2003; licensed and approved by Rappahannock County. Proven income with shuttle services and seasonal hostel; I’m looking to move closer to my grandchildren. Hostel has bunk house that sleeps 12+; living area for hikers with laundry, bathroom with shower, kitchen area with refrigerator and freezer, and TV. Upstairs living area includes 3 bedrooms, full bath, dining room, large back deck, shed, large backyard with mature trees and privacy fence. Room for 6 cars. $250,000 or make offer. Contact Mike Evans “The Grateful Greenpeace Guy” (owner of the Front Royal Terrapin Station Hostel) at: (540) 539-0509. The 37th annual Gathering of long-distance hikers, friends, and A.T. dreamers will convene the weekend after Columbus Day, Oct. 12-14, 2018, at Shippensburg University in Shippensburg, Pennsylvania. Come for workshops on hiking the A.T. and long-distance trails around the world, the hiker fair, entertainment, and to meet hiker friends old and new. For more info visit: aldha.org/gathering. Intro to Hiking the Appalachian Trail Workshop – August 25 at 11:00 am, Harpers Ferry, West Virginia. This 90-minute class offered by the Appalachian Trail Conservancy (ATC) at their Harpers Ferry Visitor Center is for those considering a section or thru-hike of the Appalachian Trail. It will cover how to access and navigate the Trail, what to pack, permits, how to store food in the backcountry, and other essential skills. Part of the class will be held outdoors. The class is open to the general public and is free. Advance registration is recommended. Visit: appalachiantrail.org/events for more details and a registration link. Two Sister Trails — One Celebration. Tuesday, October 2, 2018. Virtual Event: ATPCT50.org. With the passage of the National Trails System Act in 1968, America was given a gift — the creation and protection of some of Americans’ favorite places to discover the great outdoors. Trails that celebrate outdoor adventure and recreational opportunities are paramount to helping individuals live happy, healthy, and fulfilled lives. In 2018, the U.S. will be celebrating the 50th anniversary of the National Trails System Act and the creation of the first two national scenic trails. Join an online celebration as we honor the creation of both the Appalachian Trail and the Pacific Crest Trail. Celebration includes: Captivating stories covering the history, challenges, and future of our Trails; Special guests including authors Bill Bryson and Cheryl Strayed; Suzanne Dixon, President of the ATC; and Liz Bergeron, Executive Director and CEO of the PCTA; Online auction featuring Trail memorabilia and exclusive vacation experiences, and a Ceremonial Toast. This event is hosted by the Appalachian Trail Conservancy (ATC) and the Pacific Crest Trail Association (PCTA). For more information visit ATPCT50.org. book I read years ago, SOLO: On Her Own Adventure, by Susan Fox Rogers, introduced me to the idea of doing a backpacking trip alone. I’ve been talking about it ever since. Keyword: talking. For over 10 years. Ok, maybe closer to 20. So, in my 49th year, sitting at my desk in my windowless office, surrounded by shades of gray, contemplating a milestone birthday year and typing random strings of A.T. hike-related text into the search bar, an idea was sparked. An idea that has since turned into a plan, which will come to fruition this August, the week after my 50th birthday: 50 miles for 50 years. Could never having spent the night in the woods by myself, yet having the strong call to backpack be a problem solved this year? The A.T. — quite literally my back yard — has been a wonderfully rewarding and therapeutic respite for the past two decades I’ve lived in Maryland. It has been a training ground for walks and trail runs and innumerable dog walks. We’re on our fourth dog since moving close to the Trail and the section we call home holds memories of each of those fur babies. There’s been many tree, wildflower, and bird identification hikes with my husband; him the patient teacher, me trying hard to remember. In 2015, my girlfriend and I completed the Maryland miles over several day-hikes and shuttle set ups together. I always enjoy dishing up Trail magic to the thru-hikers, things like rides to town or hiking in treats to give out at the nearby shelter. As you can tell, my love for the A.T. and the hiking community is strong. The A.T. — quite literally my back yard — has been a wonderfully rewarding and therapeutic respite for the past two decades I’ve lived in Maryland. It has been a training ground for walks and trail runs and innumerable dog walks. We’re on our fourth dog since moving close to the Trail and the section we call home holds memories of each of those fur babies. There’s been many tree, wildflower, and bird identification hikes with my husband; him the patient teacher, me trying hard to remember. In 2015, my girlfriend and I completed the Maryland miles over several day-hikes and shuttle set ups together. I always enjoy dishing up Trail magic to the thru-hikers, things like rides to town or hiking in treats to give out at the nearby shelter. As you can tell, my love for the A.T. and the hiking community is strong.